Turkish president Recep Tayyip Erdogan appears to have thrown an obstacle in the path to a Cyprus peace settlement, saying Turkish troops will be on the island in perpetuity. Speaking after talks in Geneva were adjourned, Mr Erdogan also said on Friday that the envisaged terms of a rotating presidency for a unified island were unacceptable. The terms were a cornerstone of planned new governance arrangements. The remarks, taken at face value, suggest UN peace efforts have probably not got as close to a deal as the UN sought to suggest at the end of the four days of talks on Thursday. The conference ended with an agreement that officials would restart detailed talks on January 18th. No date was set for a further meeting at the political level. A peace settlement for the island, divided since 1974, would need a new form of security guarantee, and Greek Cypriots are demanding a timetable for the removal of 30,000 Turkish troops. The fact that the conference for the first time dealt with the issue of guarantees, seen as the most difficult issue facing the negotiators, is regarded as progress in the intractable dispute. At present the three security guarantors are Turkey, Greece and the UK, as the former colonial power. A UN force is on on the island on the buffer zone to prevent a return to inter-communal violence. Turkish officials released remarks by the foreign minister, Mevlüt Çavusoglu, to the conference insisting Turkey was not willing to abandon its security role. Mr Çavusoglu reportedly told the closed-door session in Geneva: “Taking into consideration the current situation in our region, the continuation of the security and guarantees system, which has been the solid basis of the 43-year-long security and stability on the island, is a necessity”. Some argue Mr Erdogan cannot afford to compromise on the issue of Turkish troops at present while he battles with his parliament to secure majority support for an executive presidency, his chief political goal at present. Votes are going his way in the parliament by relatively narrow margins. Greece put forward a variety of plans for a new security guarantee, including looking at the model of German troops after the withdrawal of Russia from East Germany. 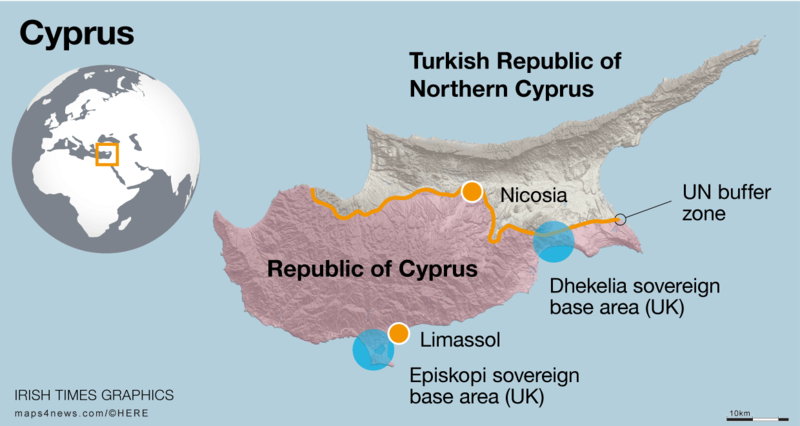 Britain retains military bases in Cyprus that are sovereign British territory, but it has offered to give up nearly half of its land as part of a final settlement. Any deal would need to be approved by referendums in both Turkish Cyprus in the north and Greek Cyprus in the south.